While the idea of a new, female Thor has always felt... well, gimmicky at best, it has given us quite a few excellent stories. But none have been better than this (maybe) final adventure, titled "The Death of The Mighty Thor." The stakes are high, as the incredibly powerful Mangog has attacked Asgard, beating both Odin and his son, the former Thor (now just called Odinson). The last line of defense is Jane Foster, who wields Mjolnir as the new Thor, but what hope does she have against a creature fueled by hate and backed with the power of a billion billion beings? It's laid out in an emotional and frenzied story that's both moving and over the top - and it manages the difficult task of sticking the landing. There are quibbles to be had along the way, a few gaps in logic that may give some readers pause, and some panels of art that are so frenzied I'm not sure what is happening - but those are minor problems. 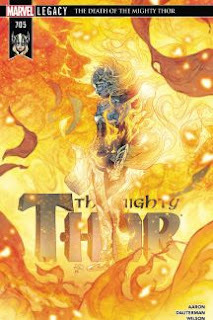 What you get here is an explosion of a "next-to-the-last" (maybe) issue of the Mighty Thor, and the art and story are absolutely stunning. And hey, next issue (presumably) we'll see where this all goes next.